Facts such as these have led many cancer biologists to question how useful the gene-led approach to understanding and treating cancer actually is. And some have gone further than mere questioning. One such is Andrea Califano of Columbia University, in New York. He observes that, regardless of the triggering mutation, the pattern of gene expression—and associated protein activity—that sustains a tumour is, for a given type of cancer, almost identical from patient to patient. That insight provides the starting-point for a different approach to looking for targets for drug development. In principle, it should be simpler to interfere with the small number of proteins that direct a cancer cell’s behaviour than with the myriad ways in which that cancer can be triggered in the first place. This week, therefore, in a paper in Nature Reviews Cancer, he and Mariano Alvarez, a colleague at Columbia, pull together over a decade of work in an effort to understand how the proteins that regulate cancer are organised. Dr Califano and Dr Alvarez call this organisation “oncotecture”. Creating the oncotectural blueprint for a cancer starts by analysing the gene-expression profiles of cells from samples of that cancer. A gene-expression profile describes which genes are active in a cell’s DNA, and how active they are. Because genes encode proteins it gives a sense of which proteins, and how much of them, a cell is making. Many of these proteins are involved in regulating cellular activity, including growth and cell division (the things that go wrong in cancer), via signalling pathways in which one protein changes the behaviour of others (sometimes hundreds or thousands of others), each of which then changes the behaviour of others still—and so on. Applying a branch of mathematics called information theory to these data, to make them manageable, Dr Califano then maps the connections inside a cell. 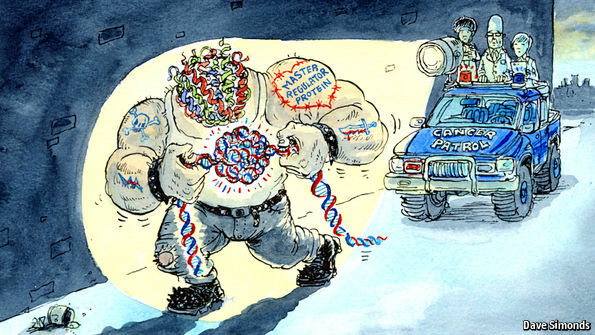 One of his most important discoveries is that the resulting networks have a few “master regulator” proteins, which control the largest numbers of other proteins. Dr Califano, whose father-in-law was a Mafia prosecutor in Italy, likens these to the bosses of a network of organised criminals. He sees his job as working out the links between them, in the same way that a detective might study a gang in order to find out who is in charge. So far, he has analysed data from 20,000 tumour samples and generated maps for 36 types of tumour. All told, he has identified about 300 proteins that are probably master regulators in at least one sort of cancer. These are organised into groups of ten to 30 in each tumour type, and are probably, collectively, responsible for controlling most human cancers. The master regulators, it turns out, are mostly proteins that affect transcription—the process that copies information in DNA into messenger molecules that carry it to a cell’s protein factories. In Dr Califano’s view, it is these master regulators that drugmakers should concentrate on, since drugs that modify such proteins’ activities are likely to be widely applicable, in contrast to those focused on genetic mutations. Indeed, the choice of best targets may be even narrower than this, he says—for among his master regulators lurk a few capi di tutti capi. In the view of Gordon Mills, of M.D. Anderson, one example of such a capo is an oestrogen-receptor that is involved in breast cancer. This is a transcription factor that controls the expression of many genes. Disabling it with a drug such as tamoxifen, so that it can no longer run its part of the network, is thus particularly effective. Dr Mills says it gives an “incredible outcome”, regardless of the mutations that triggered the cancer in the first place. A second example he cites is Bruton’s tyrosine kinase, which regulates various malignancies of white blood cells. On top of these specific actions master regulators, like pieces of badly written software, can also set up loops that feed back on themselves and so, once activated, do not shut down. In aggressive prostate cancer, Dr Califano observes, two proteins called FOXM1 and CENPF act together in this way to promote a tumour’s growth. In glioblastoma, a cancer of the brain, three proteins collaborate to start and maintain the cancer. And, according to John Minna of the University of Texas Southwestern Medical Centre, in Dallas, two master-regulator proteins in particular govern the malignancy of small-cell lung cancer. Dr Minna does, though, argue caution in the master-regulator approach. First he observes, lots of known and suspected master regulators are in classes of protein that have proved difficult to affect with drugs. Second, not all of the master regulators suggested by Dr Califano’s modelling work have been shown to act as such in a laboratory. More experiments are needed to see which of his candidates really are proteinaceous mafiosi and which mere stool pigeons that have had the finger pointed at them incorrectly. To that end, several studies are under way. One, at Columbia itself, is recruiting volunteers with cancer to see if attacking putative master regulators in their tumours works in cell cultures or when parts of the tumours in question are grafted into mice. If this approach yields dividends, that will suggest that attacking master regulators could be an effective way to treat cancer. Along with existing drugs tied to particular mutations, and a newly emerging class of pharmaceuticals that mobilise the immune system against tumours, master-regulator blasters could provide a third form of precise molecular attack upon this most feared of diseases.